This month and next Habitat for Humanity is celebrating the opening of two newly built Toronto-area homes for low income families while also honouring two real estate heavyweights. The effort’s organizer, David Ogden, who is also the founder and president of Secure Capital Advisors, has assembled support from a number of real estate companies to secure land and build homes in the city since 2009. This year is the group’s most successful effort, doubling its traditional one-per-year build rate. “We have two homes that we are dedicating this year, but we really started this about six years ago, raising money and building homes for families in need in Toronto,” said Ogden, who previously sat on the board and continues to be a member of the organization’s real estate committee. The new Habitat homes on Brimley Road in Toronto’s east end are dedicated to the late Tony Arnoldi and “friend and mentor” Gerald Knowlton. Ogden expects the group will be able to build more homes in the GTA going forward after last year’s merger of Habitat in Toronto with the group serving Peel and York regions to form Habitat GTA. That should make it easier to find the most hard to secure resource, namely suitable land for home building. “We had a real problem trying to find lands that were affordable in the 416 area code as you can imagine,” explained Ogden. 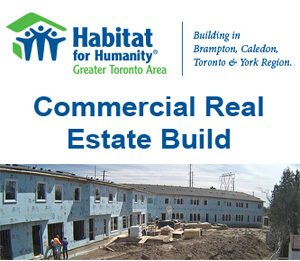 Habitat is currently building 34 homes in the GTA and Ogden expects that number to rise dramatically with the addition of the nearby Peel and York regions. Key support for Ogden’s Habitat drive has been the Sorbara family headed by Joseph Sorbara and the Bratty family’s Remington Homes group. Ogden said he was initially excited to be part of the Habitat effort because its lean operational model ensures “every penny” raised goes towards building homes. (The organization’s ReStore retail outlets support the cost of overhead). 6. All donations and mortgage payments are reinvested back into the home ownership program. “The perception is people might think ‘Habitat is poor families, I don’t know if I want them around us.’ But the reality is that every one of these families has to qualify in terms of their income and go through a pretty rigorous process in order to qualify for a home. “As a result these families, although we do subsidize them in many ways, they are actually paying for their homes,” Ogden said.